This is a demonstration that dramatically shows an example of endo and exothermic processes in one reaction. It was developed by retired teacher Greg Presnall. The demonstration requires serious caution. 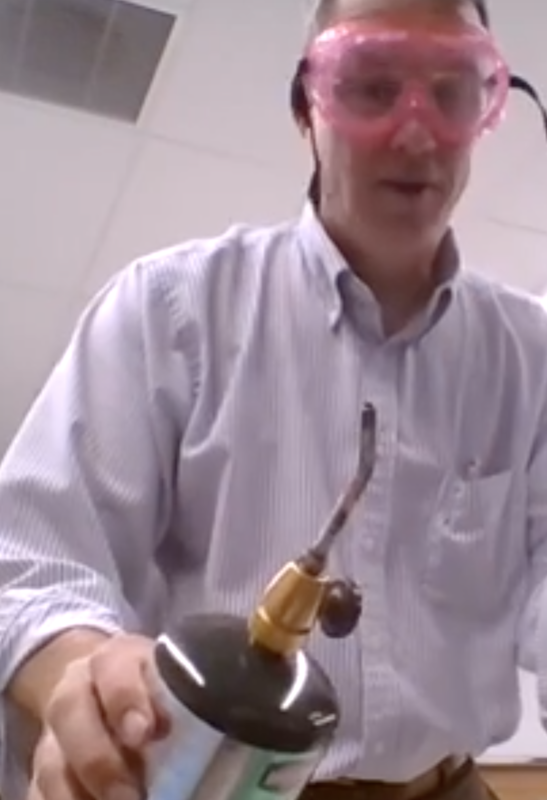 You must have a good background in chemical demonstration safety before you ever do this in front of students. The safest way to share this is to just show them the video below. I used a portable can of propane along with an attachment for using propane to solder copper pipes. Both are commonly found at hardware stores. I altered the soldering attachment by unscrewing the tip of the attachment so that I could see only a pipe with threads on the end and then attached this to the propane tank. (Trying this demonstration as shown in the video without altering the soldering attachment correctly will result in injury.) In the video, you can see that I slowly brought a lit match to the pipe and turned on the propane so a little flame occured. You should notice the flame is orange. There is not proper mixture of air and propane at this point. This is due to the tip that was removed from the attachment. The torch is held upright as I turn the gas up to allow students to carefully sense the heat with the large flame. This is the exothermic process of the propane burning. With the gas still on and a large flame, I turned the tank upside down. I allowed the flame to burn until I could see small drips come out of the bottom. I turned the gas off and blew out the flame. Upon examining the pipe, it is so cold that you can see frost on the pipe. This is the endothermic part. So what is happening? endo & exo demo from ChemEd Xchange on Vimeo. Propane is a liquid inside the tank. The liquid portion is on the bottom. The gas is on top. The liquid is what exits the pipe when it is tipped upside down, as opposed to when it is right side up. This liquid has an extremely low boiling point. As it moves down the pipe, it takes heat from the pipe and changes from a liquid to a gas. This is the endothermic process. As this process continues the pipe gets so cold that there is not enough heat for the propane to go from a liquid to a gas. It exits the bottom of the pipe as a liquid. Drops of propane can be observed. Once the flame is extinguished, the pipe is so cold it collects frost. If you determine you can safely try this demonstration, there are several important cautions I want to mention. Students need to be warned that the plumbers torch has been altered for this experiment. If they see someone soldering with a plumbers torch and they put their hand on the end of the unaltered device immediately after use, they will get badly burned. Second, the instructor should always inspect the tank of propane. Carefully tip the tank. If you cannot feel the liquid sloshing around, it is close to empty. There is mostly gas in the tank. The endothermic part of the experiment will not work. Use a new tank instead. Finally, I have students come up during the experiment to feel the “heat” of the flame and then touch the frosted pipe at the end. I always make sure to touch and inspect the pipe first.